The New Contractor Series from Cementex is the perfect bland of high quality safety equipment in an affordable package. This new series provides qualified electricians the safety they deserve and the value they require in complying with OSHA, and NEC guidelines. Each HRC-2* Contractor kit includes; Coveralls (made in the USA), Arc Flash Face Shield and Dielectric Hard Hat (10 Cal Rated), Balaclava Sock Hood, Safety Glasses, and Earplugs. All of which are required to achieve compliance with NFPA 70E Hazard Risk Category 2*. Customize your kit by including a set of 1000V Rated Insulated Tools, a convenient Backpack or Class Rated Insulating Rubber Gloves. Coverall, 10Cal face shield, balaclava, safety glasses, earplugs in standard storage duffel bag. Coverall, 10Cal face shield, balaclava, safety glasses, earplugs, TR-9ELK in standard storage duffel bag. 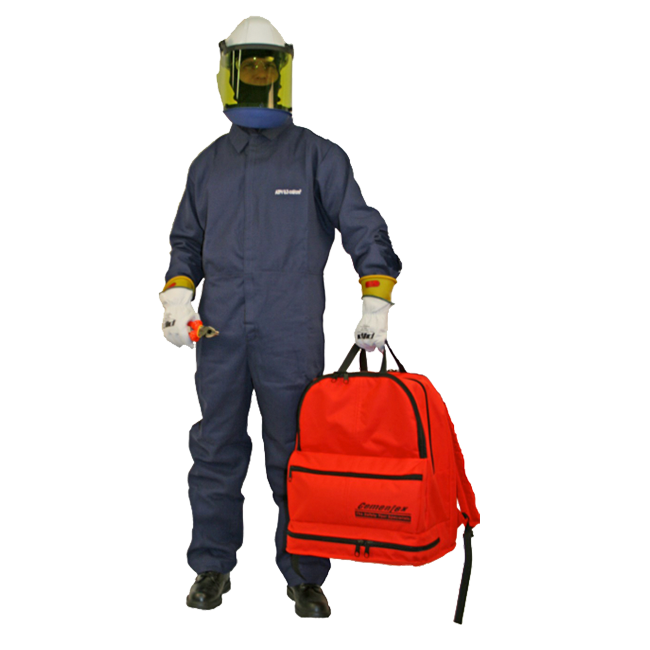 Coverall, 10Cal face shield, balaclava, safety glasses, earplugs in standard backpack. Coverall, 10Cal face shield, balaclava, safety glasses, earplugs, TR-9ELK in standard backpack.